The new season of the FIA World Endurance Championship will start this weekend at the iconic Circuit de Spa-Francorchamps. The 2018-2019 FIA WEC super season would be a unique competition because two Le Mans 24 Hours events will be included into the same championship for the first time in a history. 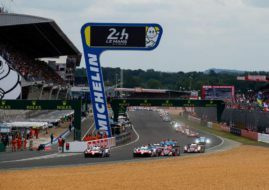 Besides two races at Circuit de la Sarthe, the 8-race calendar features two races at Spa-Francorchamps and four more events at Silverstone Circuit, Fuji Speedway, Shanghai International Circuit and Sebring International Raceway. Following a withdrawal of German manufacturers from LMP1 class, only Toyota will continue to run their TS050 Hybrid prototypes in the premier category of the championship. Five other private teams announced a participation in LMP1 class with five different non-hybrid prototypes. Rebellion Racing will run two Gibson V8-powered R13. The American team DragonSpeed will use the same engine in BR Engineering’s BR1 chassis. The Russian outfit SMP Racing will use the same BR1 chassis but with AER V6 Turbo engines in their #11 and #17 cars. Two more V6 Turbo powerplants will be in use by CEFC TRSM Racing and ByKolles Racing. The Chinese team will use Mecachrome engine in two Ginetta G60-LT-P1 cars while Austrian team will use Nismo engine in their ENSO CLM P1/01 chassis. For the second season in a row, the LMP2 grid will consist exclusively of Gibson V8-powered cars. Six teams announced a participation for the entire season with seven cars. For Le Mans 24 Hours in June, the grid will be expanded to 20 LMP2 cars. Ten GTE Pro entries from five manufacturers will contest for GT Trophy. AF Corse (Ferrari), Chip Ganassi Racing (Ford), Team MTEK (BMW), Porsche GT Team and Aston Martin Racing will have two cars each. In the GTE Am class, nine full-time entries were announced for the super season. In total, 36 crews are on the entry list for the 2018-2019 FIA WEC season: ten LMP1s, seven LMP2s, ten GTE Pro crews and nine GTE Am crews. When talking about drivers, the former F1 champion and current McLaren F1 Team’s driver Fernando Alonso gained the biggest interest of media and fans. The Spaniard will compete full season in the #8 Toyota TS050 Hybrid, sharing a car with Sebastien Buemi and Kazuki Nakajima. Another former F1 champion, the Briton Jenson Button, has been recently announced as a full-time driver in SMP Racing’s line-up, together with Mikhail Aleshin and Vitaly Petrov in the #11 car. Button will skip the season-opening round at Spa due to clashing commitments with Super GT Series. In all categories, the grid will be full of world champions and Le Mans winners, including Andre Lotterer, Neel Jani, Loic Duval, Sebastien Buemi or Anthony Davidson among prototype drivers. James Calado and Alessandro Pier Guidi will try to defend GT title in a Ferrari while Aston Martin Racing’s championship-winning trio Paul Dalla Lana, Mathias Lauda and Pedro Lamy will fight again for GTE Am Endurance Trophy.